Photo of mouth taken on Sun 21Oct18 shows water covering mouth from bank to bank. 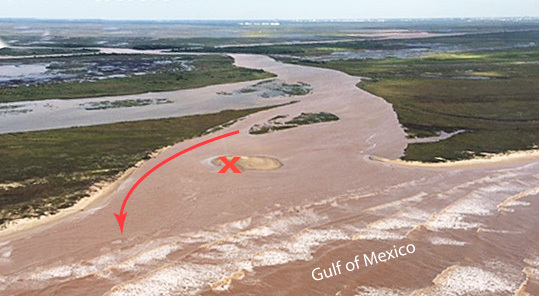 A week later, on Mon Oct 29th, FOR Environmental Chairman Tim Logan stood on dry sand, (“X” on photo) to video tape the channel (red line) flowing out the mouth to the Gulf. At the time, tide level was low at 0.0MSL with outgoing current.